Next up on our Song-By-Song preview is the official entry from Bulgaria, “Bones” by Equinox written by Borislav Milanov, Trey Campbell, Joacim Persson, and Dag Lundberg . The song is performed in English. The group is made up of Bulgarian singers Zhana Bergendorff, Georgi Simeonov, and Vlado Mihailov, and American singers Johnny Manuel and Trey Campbell. The song will be performed 10th in the competition order on the first semi-final on May 8. Bulgaria has been producing some huge support in certain sectors of EuroVision fans the last several contests, with Kristian Kostov ending up in a tight race for the top last year, finishing a close second with his song “Beautiful Mess“. 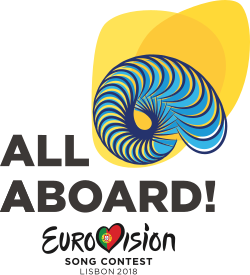 And 2018 might be their year – “Bones” is proving to be one of the monsters with EuroVision fans; it has been near the top of many of the fan-produced favorites video countdowns on YouTube, came in near the top last month on EuroVision’s most-watched videos list, and DID top the official EuroVision poll of fans from the US (more on this in a moment). This dreamy number takes some intense lyrics about a love that is so deep that it goes “beyond the bones”, puts the barest of Enigma-like dance beats behind it, lets the vocals take center stage, and the result is one of the best song entries this year. The vocals are haunting, although I wish the video was a bit better – it’s basically a lyric video, but still, there’s something about it that sends chills down my spine every time I listen to it. The huge US support that the song appears to have bodes well for its chances on the US Charts should a distribution deal be made available. It might have something to do with the already huge fan following that group member Johnny Manuel has here in the states – Manuel was a 2017 America’s Got Talent participant, where he earned a Golden Buzzer from guest judge Seal, and made it all the way to the semi-finals. Needless to say, this song could be a MONSTER in the US if given the chance to prove itself by the American labels…. Bulgaria first participated in Eurovision in 2005, making them one of the newer kids on the block; they have participated eleven times, missing a couple years here and there due to various reasons. Although in the years they have participated they have made it to the Grand Final only three times (several times despite rabid fan followings for certain numbers), all three were top five finishers, and as noted above, 2017 was their best showing yet, with Kristian Kostov’s gorgeous ballad “Beautiful Mess” landing in the runner up position, more than 200 points ahead of the third place finisher and just over 100 points behind winner Portugal. “Bones” has such a huge following among fans that this really COULD be their year if the juries and televotes align…. Here’s the official music video – see what you think!